Penguin Book sent me a copy of Alida Ryder’s recipe book, Simple and Delicious to review and as the cover says, I can well believe that these are recipes from the heart. The foreword is by one of my favourite writers, Sam Woulidge and I know if she endorses this recipe book then it has to be good. What struck me first and foremost was the section of items Alida keeps in her pantry which includes dry ingredients, fresh ingredients and frozen products. It reminded me of the list of basic ingredients Jamie Oliver suggested for the larder in his first recipe book, The Naked Chef. First published in 1999 by Penguin Books, I am sure that this list did for young cooks then that Alida’s list will do for young cooks now. It is always good to know what to buy the first time you stock up on things, and then you can adjust your pantry to your needs, as your cooking skills grow. And growth in the kitchen is where Alida aims her book and her blog. This 197 pages of recipes begins with light meals and starters and covers the basics of a basil pesto (page 5) to the more complicated Cajun prawn salad with aioli (page 24). This is followed by a chapter on pasta and it is from here that I chose the recipe to test. I made the baked penne with aubergine, courgette and sun-dried tomato (page 36). As Alida says, you do not miss the meat in this dish. With a serving size of 4-6 I chose to halve the recipe and it was enough for Dave and I to have seconds and enough for lunch for both of us the following day. The only thing I missed in this recipe was some seasoning in the vegetables. I would normally add salt and freshly ground black pepper but I wanted to stick to the recipe as listed. It worked perfectly but Dave did comment on the lack of salt. I love that the chicken section has a recipe for butter chicken bunny chow (page 52) as I think this represents South Africa so well. In the chapter on meat you will find recipes for lamb, pork and beef. This is followed by a selection of seafood recipes which includes a crab curry (page 113). Crab curry is one of my favourite dishes, but sadly we do not get crab in the Western Cape. I will however keep this for the next time I travel to Johannesburg. 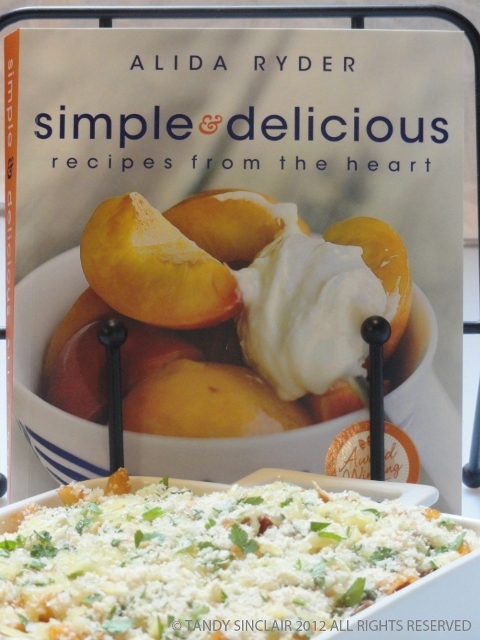 There are 11 vegetarian recipes which include recipes for stuffed mushrooms (page 137) and risottos. Onto desserts which will teach you how to make fritters, flapjacks and truffles followed by baking which covers cupcakes, cookies and macaroons. The recipe book is not photograph heavy but the one for vanilla macaroons with chocolate ganache filling (page 185) captures my eye each time I turn the pages of Simple and Delicious. I like that Alida has a conversion chart in the book as it means people from all over the world can enjoy it. Another plus is the index at the back of her book which helps when you are looking for a recipe, but you cannot remember which book it is in. Nice review, would you say this would be a good choice for an inexperienced cook? Nice review Tandy…it sure looks good! Maybe you can make us some stuffed mushrooms with a Korean twist? 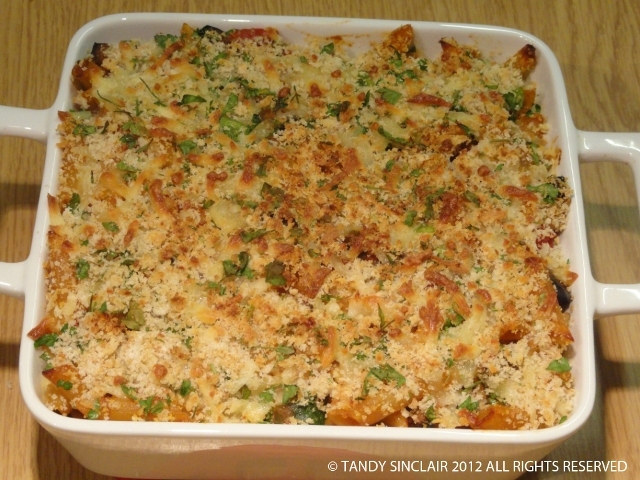 baked pasta with aubergine, courgette and sun-dried tomatoes sounds delicious…my type of food. It sounds like a good book, perfect for Christmas. Hi Giovanna, I was lucky enough to be asked by Penguin Books and maybe you can contact a local publisher in Spain so that you can do the same?